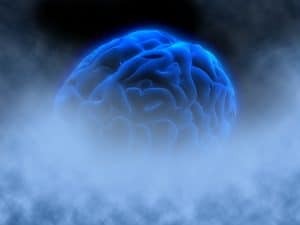 Brain fog is the term used to describe the feeling of confusion and inability to concentrate or focus your thoughts despite your best efforts. It’s like living in a haze or fog. There are other neurological symptoms that accompany it, such as depression, cognitive issues, memory loss, searching for words, and anxiety. Brain fog is an indication that you have inflammation in your brain caused by the immune cells, called microglia, in your brain. Thyroid hormone can help keep these cells in check, which is why brain fog often lessens if you’re well treated with thyroid hormone replacement. I work in the technology sector where I regularly have to deal with highly technical concepts. Normally, I’m an overachiever, highly motivated, and I know I’m smart. Right now, I don’t feel smart. I’m exhausted, I’m not motivated in the least, I’m lucky I remember my own name let alone events from 5 minutes ago, and highly technical concepts fly right over my head. That is Hashimoto’s brain fog and I hate it. I can deal with the exhaustion and I can deal with most of the other symptoms, but I have a difficult time dealing with the brain fog. When my brain isn’t functioning right, it’s hard to do my job right. I struggle to keep up with everyone else. That’s stressful because my family is depending on me. And stress doesn’t help matters any. As a result of this brain fog, I know I’m suffering some low-level depression. Fortunately, I know what’s going on and can take steps to mitigate my issues, but many people suffering from Hashimoto’s or hypothyroidism don’t. Some of them aren’t even diagnosed yet. In fact, many people are misdiagnosed with mental illness, when simply treating the thyroid properly will help. Many women in my family know this from personal experience, anti-depressants don’t help this. There are times when Hashimoto’s brain fog can make you feel like you’re losing your mind. You forget things easily or find it hard to remember things you should know. You can’t find words, even common ones, and you find yourself pausing to think of them. The cognitive issues from brain fog can even prevent you from understanding concepts you normally wouldn’t have a problem with. There are several theories about what contributes to brain fog. Some experts say leaky gut leads to leaky brain. Other factors include chronic stress (yeah, I know all about that! ), poor diet, insulin resistance, and untreated or poorly treated autoimmune disease. So, how does one treat brain fog effectively? Well, the two main objectives are making sure your thyroid is well treated and reducing your brain inflammation. Request thyroid labs from your doctor, including Free T3, Free T4, Reverse T3, and antithyroid antibodies. If your TSH is above 3 and you’re having a lot of symptoms, work with your doctor to get it between 1-2. Many Hashimoto’s patients report feeling best in that range. My doctor has upped my thyroid medication dosage and my TSH is slowly coming back within what I call the “sweet spot”. Nutrition is important. I am trying (not always succeeding) to eat better to support my gut health and, in addition, my brain health. Going gluten free reportedly helps autoimmune sufferers reduce inflammation and antibodies. Getting a good night’s sleep gives your body the time to repair and renew itself. What has seemed to work best to battle my brain fog was asking my endocrinologist to try a T3 medication (such as Cytomel). Some Hashimoto’s patients have trouble absorbing or converting their T4 medication (Synthroid, Levothyroxine, etc) and I suspected I was one of them. After reviewing my lab work, my doctor agreed, and the fog has almost completely lifted. One of the things I have promised myself this year is to take charge of my health. That includes educating myself on Hashimoto’s, breaking bad habits, adopting healthy habits, and making self-care my priority. And since I am a perfectionist and overachiever, I’m learning to cut myself some slack when I’m not perfect or just not productive. As part of my education, I’m reading a LOT more. I’ve just ordered “Why Isn’t My Brain Working? : A Revolutionary Understanding of Brain Decline and Effective Strategies to Recover Your Brain’s Health” by Dr. Datis Kharrazian. He was one of the very knowledgeable experts in The Thyroid Secret documentary. In addition, Dr. Izabella Wentz’s new book “Hashimoto’s Protocol: A 90-Day Plan for Reversing Thyroid Symptoms and Getting Your Life Back” just came out! I’m reading it, too. I’m going to educate myself and take action. I hope you’re educating yourself and getting your life back, too! If this post helped you or know someone else it will help, please share!